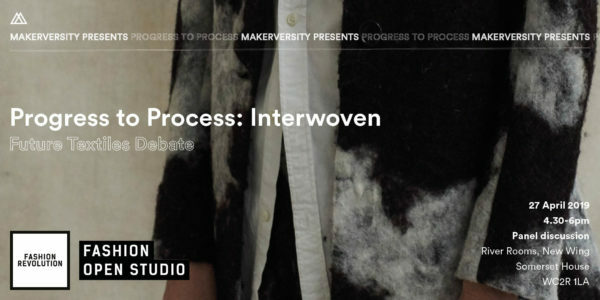 Interwoven is a weekend festival which explores how textile innovation intersects with design and activism to create sustainable change within the fashion industry and beyond. As we bring together climate change activists, designers and fashion brands across technology, science, textile and fashion, join us in reconsidering what you wear and how it was produced. Join us to debate textiles’ material and sustainable future, within and beyond the fashion industry. How can we upturn the production process and involve new voices in terms of innovation and experimentation, working in cross-collaboration across design, fashion, material explorations and activism? Come explore ways fabric innovation can influence who makes our clothes and how – from material innovation to transparency in the production process, through to changing our own mindsets around how we consume and wear fabrics. The fabric of what we wear is being woven now – come have your say in its making! ADAY is a direct-to-consumer brand with the aim to lift the standard for clothing. They fuse seasonless shapes with technical fabrics and a sustainable supply chain to create a wardrobe that does more with less. In March 2018 they were named one of the Most Innovative Companies in the World by Fast Company. Co-founders Nina and Meg have also been named Forbes 30 Under 30. Doppelhaus Ltd is a textile company specialising in utilising non-woven technology for the creation of high-quality fabrics. Their approach includes research into supply chains, sustainability and surface technology and design.